Peripheral intravenous (IV) line placement is one of the most invasive and painful procedures performed by nurses. Although it is a common nursing procedure, sufficient and effective skill training is necessary before nurses, especially new nurses, work with patients. 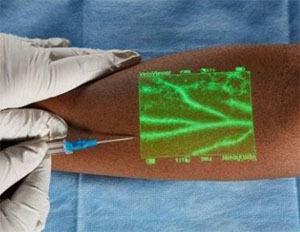 Vascular access imaging devices (VAIDs) have been developed and put into use in hospitals. Many studies have been conducted to evaluate the effectiveness of the device in clinical settings such as in neonatal care, pediatric care, emergency care, etc., but the effectiveness of the device in training nurses who have just recently graduated has rarely been reported, especially in Japan. In this paper, we report on a quasi-experimental study that evaluated the effectiveness of the VAID for training recent nursing school graduates to successfully perform IV line placement. Eleven newly registered nurses participated in this study. Their preparations were video recorded for analysis. Students’ t-tests were used to compare time and success rates of IV placement with VAID assistance and without it. Furthermore, subjects reported their feelings and the self-evaluation related to VAID use by answering a questionnaire, and their responses were analyzed. The results showed no significant change in the length of time needed nor in the success of peripheral IV line placement when the VAID was used; however, nurses indicated the VAID did help them in deciding where the IV should be inserted. These results suggest that the use of the VAID could be clinically meaningful as an IV training tool and that it could reduce the time needed to select venipuncture sites. Y. Murakami, Y. Ohno, M. Nishimura, M. Kido, and K. Yamada, “Evaluating the Effectiveness of a Vascular Access Imaging Device Used in Training Recently Graduated Nurses,” J. Robot. Mechatron., Vol.29, No.2, pp. 346-352, 2017. M. Kaur and S. Kaur, “Methods to increase peripheral veins visualization in patients getting chemotherapy,” Int. J. of Nursing Education, Vol.4, pp. 1-3, 2012. S. F. Smith, D. J. Duell, and B. C. Martin, “Clinical Nursing Skills: Basic to Advanced Skills (7th Edition),” Stanford, Ct: Appleton & Lange, 2007. M. Yokota and R. Kawashima, “Circumstances and Problems for Practice of Intravenous Injections by Nurses,” Bulletin of Fukushima School of Nursing, Vol.11, pp. 39-48, 2009 (in Japanese). A. F. Jacobson and E. H. Winslow, “Variables influencing intravenous catheter insertion difficulty and failure: An analysis of 339 intravenous catheter insertion,” Heart & Lung, Vol.34, No.5, pp. 345-359, 2005. A. E. Bair, J. S. Rose, C. W. Vance, E. Andrada-Brown, and N. Kuppermann, “Ultrasound-assisted peripheral venous access in young children: a randomized controlled trial and pilot feasibility study,” The Western J. of Emergency Medicine, Vol.9, pp. 219-224, 2008. K. A. Peterson, A. L. Phillips, E. Truemper, and S. Agrawal, “Does the Use of an Assistive Device by Nurses Impact Peripheral Intravenous Catheter Insertion Success in Children?,” J. of Pediatric Nursing, Vol.27, pp. 134-143, 2012. M. C. K. Do Amaral and M. A. M. Pettengill, “Using ultrasound to guide peripheral venipuncture in children: The importance of the technique for nurses,” ACTA Paulista de Enfermagem, Vol.23, pp. 472-478, 2010. T. Reeves and D. Morrison, “An Innovative Nurse-Driven Ultrasound-Guided Peripheral IV Program for Medical Surgical and Progressive Care Units: From Concept to Implementation,” J. of the Association for Vascular Access, Vol.18, pp. 213-213, 2013. M. D. Witting, S. M. Schenkel, B. J. Lawner, and B. D. Euerle, “Ultrasound in emergency medicine: Effects of Vein Width and Depth on Ultrasound-Guided Peripheral Intravenous Success Rates,” J. of Emergency Medicine, Vol.39, pp. 70-75, 2010. C.-Y. Sun, K.-C. Lee, I.-H. Lin, C.-L. Wu, H.-P. Huang, Y.-Y. Lin, Y.-F. Hsu, and H.-R. Yu, “Original article: Near-infrared Light Device Can Improve Intravenous Cannulation in Critically Ill Children,” Pediatrics & Neonatology, Vol.54, pp. 194-197, 2013. M. Kim, J. Park, N. Rhee, S. Je, S. Hong, Y. Lee et al, “Efficacy of VeinViewer in pediatric peripheral intravenous access: a randomized controlled trial,” European J. of Pediatrics, Vol.171, p. 1121, July 2012. N. J. Cuper, J. H. Klaessens, J. E. Jaspers, R. de Roode, H. J. Noordmans, J. C. de Graaff, and R. M. Verdaasdonk, “The use of near-infrared light for safe and effective visualization of subsurface blood vessels to facilitate blood withdrawal in children,” Medical Engineering and Physics, Vol.35, pp. 433-440, 2013. J. C. de Graaff, N. J. Cuper, R. A. A. Mungra, K. Vlaardingerbroek, S. C. Numan and C. J. Kalkman, “Near-infrared light to aid peripheral intravenous cannulation in children: a cluster randomized clinical trial of three devices,” Anesthesia, Vol.68, pp. 835-845, 2013. D. J. L.-M. Wiegand and N. American Association of Critical-Care, “AACN Procedure Manual for Critical Care,” St. Louis, Mo: Elsevier/Saunders, 2011. S. J. Brown, “Knowledge For Health Care Practice: A Guide to Using Research evidence,” Philadelphia, Pa: W. B. Saunders Company, 1999. M. B. F. Makic, S. A. Martin, S. Burns, D. Philbrick, and C. Rauen, “Putting Evidence Into Nursing Practice: Four Traditional Practices Not Supported by the Evidence,” Critical Care Nursing, Vol.33, pp. 28-42, 2013. Griffis University, “Peripheral Intravenous Access and Care,” Course syllabus, 2010. F. Y. Tee, C. S. L. Low, and P. Matizha, “Patient Perceptions and Experience of Pain, Anxiety and Comfort during Peripheral Intravenous Cannulation in Medical Wards: Topical Anesthesia, Effective Communication, and Empowerment,” Int. J. of Nursing Science, Vol.5, pp. 41-46, 2015.